CHRIS Pattison has become an unlikely casualty in the Newman Government's war on criminal bikie gangs. 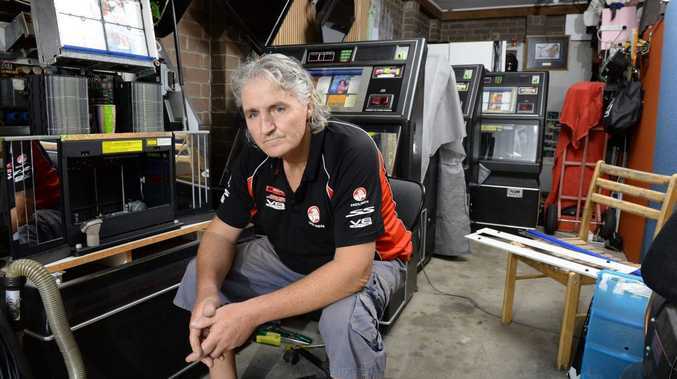 The owner of Bev's Jukebox Hire in Redbank Plains has been renting music equipment to the Life and Death Motorcycle Club since he took over the business. The 52-year-old said the club had been a regular customer of his and hired jukeboxes for clubhouse functions in Bundamba. He distributes juke boxes throughout Ipswich, Laidley and Lowood. But due to Queensland's tough new anti-bikie laws, Mr Pattison said the club was now unable to meet for fear of prosecution. "It's a shame because they've been great customers and were always respectful of the equipment," he said. "I stand to lose about $1800 a year and that's just one club. "I know another guy who hires out PA systems to them. He's going to lose a lot of business, too." The new laws limit bikies' freedom to meet and wear club insignia. "Before all this police drama kicked off, I rented an $8000 jukebox to the group that is now locked in their clubhouse," Mr Pattison said. "I can't get it back because no-one from the club is game to go near the place." Mr Pattison said he believed the new laws were "ridiculous" and needed to be modified. "A few bad apples associated with motorcycle clubs have gone and spoiled it for the whole bunch of them," he said. "The majority are just normal people. They go to work and pay their bills just like everyone else. "They are just being unfairly persecuted." But Ipswich West MP Sean Choat defended the new legislation, saying the government would no longer tolerate criminal activity. "People are always going to be inconvenienced in a number of ways simply because we don't live in a perfect world and sometimes we need to persevere to ensure these criminal gangs can't be seen to prevail," he said. "It is difficult but we have got to get rid of this criminal element. This action is harsh but it is necessary. "If there are instances where people feel they are genuinely being aggrieved or wrongly targeted then people like myself need to know about it." The State Government's crackdown on criminal motorcycle gangs has resulted in police charging 184 people with 362 offences, executing 47 warrants, issuing 102 traffic offence infringement notices and carrying out more than 4106 street checks on suspected bikies in less than three weeks.